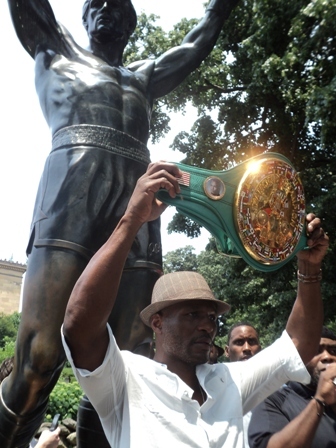 Philadelphia, PA- Philadelphia Mayor Michael Nutter honored newly crowned WBC and Ring Magazine Light Heavyweight World Champion Bernard Hopkins today for his championship win over Jean Pascal which took place May 21. The mayor presented Hopkins with a Liberty Bell replica and made a proclamation saluting Hopkins and acknowledging his history making accomplishment of becoming the oldest world champion in the history of boxing. “The ‘Rocky’ movies are an inspiration to the blue collar workers of this city. Rocky used what he had to make the best of it, which is what I had to do. I played jacks like they were aces and I made something out of nothing. “Where we are standing right now, is where I train. It is where I started. “I have run those steps [of the Philadelphia Museum of Art] for many years, even last month [in preparation for the Pascal fight]. “It means a great deal to me to be honored where I train. This is where I have come all of my life. “I lost my first fight at the Blue Horizon in Philadelphia. I lost a four round fight and I didn’t let that stop me from continuing on in my career. “I invested in my life…people ask, ‘What is your secret?’ They are waiting for me to say ‘I am that good,’ but I am here because I invested in myself and made a determination not to get caught up in the high life of being a celebrity. “Let’s give it up for Bernard Hopkins, the new Light Heavyweight World Champion. He had some challenges as a teenager. He found himself on the wrong side of the law, but in prison, he found faith in himself and in boxing. This is the real reason why Bernard Hopkins is a champion. 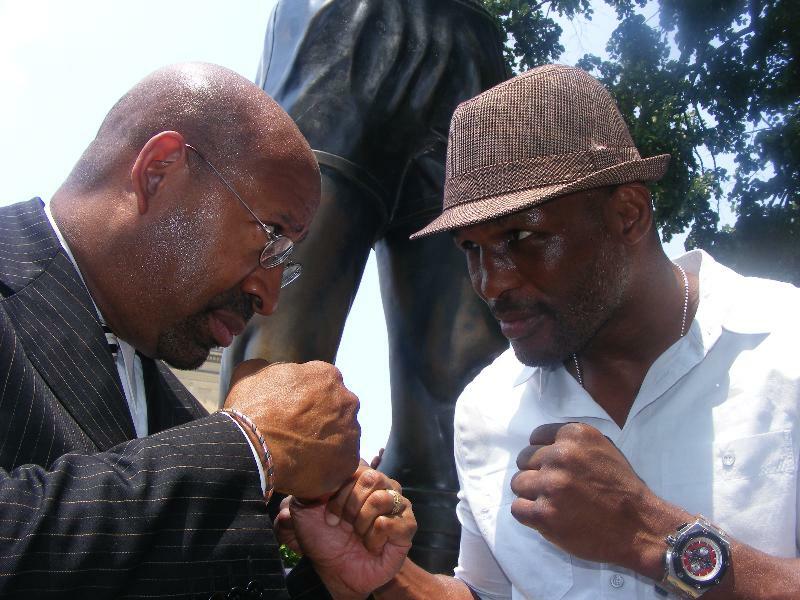 “The heritage of great boxing in Philadelphia is proudly being carried on by Bernard Hopkins. “Even more than these accomplishments, his life is a lesson to all of us. It is never too late to do something great. It is never too late to change your life.